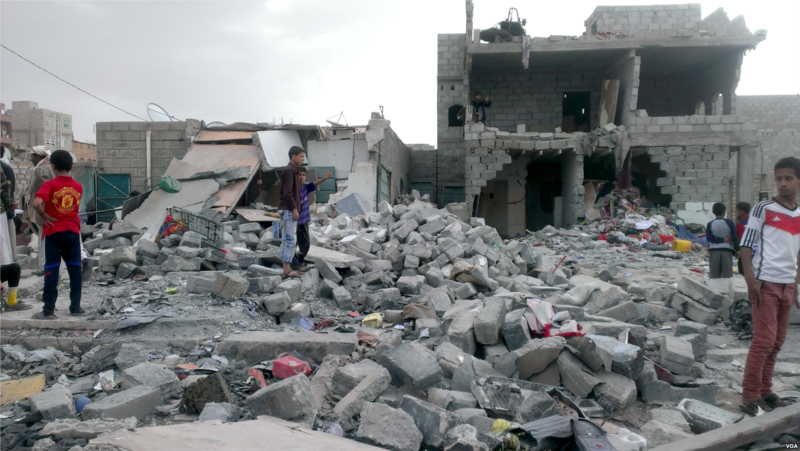 Starting in 2011, Yemen has become home to civil war, political instability, famine and one of the worst humanitarian crises in the world today. The problems began in 2011, when the government of Yemen lead by Ali Abdullah Saleh, refused to transition power to the deputy of the state Abdrabbuh Mansur Hadi. When Hadi eventually took power, the state was weaker than under Saleh, and he failed to address many issues like jihadist attacks, unemployment, and food insecurity. In response to the weakness of the state, civil war broke out between the Hadi government, and a separatist movement in the south lead by Houthi rebels that represent the country’s Shia ‘a minority in 2015. Since then the fighting has only intensified. It is estimated that as the war approaches the four year mark, over 22 million people—or three-quarters of the population—need urgent humanitarian aid and protection, 2 million people have been displaced, and 8.4 million people are food insecure (UN, 2019). According to the United Nations Development Program, Yemen is highly vulnerable to climate change-related impacts such as drought, extreme flooding, pests, sudden disease outbreaks, changes of rainfall patterns, increased storm frequency/severity and sea level rise (UNDP, 2012). It is estimated that as the war approaches the four year mark, over 22 million people—or three-quarters of the population—need urgent humanitarian aid and protection, 2 million people have been displaced, and 8.4 million people are food insecure (UN, 2019). The western region of Asia including Yemen, is historically a very water stressed area, and this trend will continue (IPCC, 2014). Countries in this region including Yemen rely on rainfall for agriculture, and agriculture makes up a significant part of their economy. As the effects of climate change get worse, fresh water availability will be affected by changes in rainfall variability, snowmelt, and glacier retreat (IPCC, 2014). According to the IPCC report on the effects of climate change, the southwest region of Asia, where Yemen is located will be impacted greatly by drought not only because of its lack of infrastructure since most people there live in sub-urban settings (IPCC, 2014). It is projected that the Arabian Peninsula could deplete its water supply due to anthropogenic factors, and expedited climate factors, by 2050 (Mazzoni, 2018). Yemen is especially at risk because of its lack of a renewable water source, or desalination infrastructure (Mazzoni, 2018). Of all the countries in the Arabian Peninsula, Yemen is exploiting their freshwater resources the fastest, is one of the most vulnerable states to climate change, and this change in water recourses will make them become one of the most vulnerable to food insecurity (Mazzoni, 2018). The second major risk that Yemen faces due to climate change is an increase in extreme weather events. Warming in the Indian ocean is increasing the strength and stamina of cyclones that reach the Arabian Peninsula. In 2018 alone, three cyclones hit the region doing a combined 1.8 Billion USD in damages. According to a recent study on the Indian Ocean and storm strength, reported that an increase in anthropogenic black carbon and sulfate emissions might have led to increase in storm strength because of a weakening of vertical wind shear (Murakami et al., 2017). Like the IPCC report on climate change, there are many data gaps in radar storm event history for the Arabian Peninsula, but these storm events are occuring more frequently and stronger (Murakami, 2017). With Climate modeling researchers have predicted that the strength of storm events in the Indian Ocean is increasing, as well as their intensity. According to the IPCC report on climate change, warmer temperatures in the 21st century will accelerate melting of sea ice increasing sea level rise globally (Srivastava et al., 2016). Using computer models, researchers have tried to predict how the rise in sea level will affect countries with access to the ocean on the Arabian Peninsula. In a first of its kind study Srivastava et al. used three forecasting models for sea level rise using exponential smoothing state space models (ESMs), and the autoregressive integrated moving average (ARIMA) model used with sea level data from the last 17 years for the Indian Ocean (Srivastava et al., 2016). It was concluded that there was too much variability from natural ocean phenomena from events like the El Niño Southern Oscillation, plate tectonic cycle and the King tide cycle, for the model to be effective or accurate (Srivastava et al., 2016). Sea level rise around the Arabian Peninsula is guaranteed, but to know specifically how it is going to affect the region more data needs to be collected (Srivastava et al., 2016).